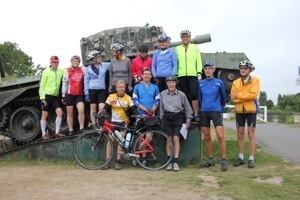 Two years ago, I pedalled across France from Caen to Cannes (C2C), La Manche to La Mediterranėe, on a CTC tour, and enjoyed it so much – and got on with the leader, Bob Norton, so well that I volunteered to drive the support vehicle for this year’s tour. I’d had a week’s van-man experience with The Fridays on LonJoG and knew I’d love it. So last Thursday saw me packed and prepared. Packed in a rucksack as I was going to take my new Bianchi with me! After a slow pedal to Northampton station, I caught a punctual train to Euston. Then, after an easy pedal to Victoria, I caught a train to Portsmouth. I used my new Garmin to navigate from Fratton station to Hilsea Travelodge and met Bob and George (deputy leader) and Georgina ( the boss). After a drink and a meal in the local Italian restaurant (the owner was quite a big Pompey fan), it was early to bed. Bob, Georgina and I were up early on Friday to catch the early ferry. Breakfast and lunch on the boat. 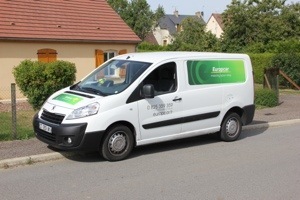 We the cycled to Caen to pick up the van from Europcar. Back to Ouistreham for dinner in the hotel (pigs’ cheeks in ossambuca sauce washed down with cider fermier). We met the cyclists off the late ferry, beers and bed. Saturday was first proper van day from Ouistreham to Argentan, with breakfast as Pegasus Bridge, elevenses at Argences, and a picnic lunch at Courcy. Accommodation at Hotel des Voyageurs in Argentan. Dinner was pork à la Normande and tarte framboise. I then fitted in a personal ride to Sėes an return – 32 miles. Sunday began with a good breakfast at the hotel. Elevenses followed at Sėes and lunch at Mamers. I drove to the hotel on the outskirts while the cyclists went to a town centre bar. I walked in to join them before going on a short personal ride to Lamnay and back, about 11 miles. Dinner at the hotel: mixed salad, chicken and pasta, and tarte des pommels.. This entry was posted in Uncategorized by ianmac55. Bookmark the permalink.